The Church of Scientology Tampa was dedicated March 13, 2011. More than 2,000 Scientologists marked the grand opening of its new home, the historic Ybor Square, Tampa’s original cigar factory. Mr. David Miscavige, Chairman of the Board of Religious Technology Center and ecclesiastical leader of the Scientology religion cut the celebratory ribbon on the new Church of Scientology of Tampa. He was joined by executives of the Tampa Church. Scientologist and Chilean recording artist Alberto Plaza performed “La Vida Es Carnival” (Life is a Carnival) with a troupe of Cuban dancers, opening dedication ceremonies of the new Church of Scientology of Tampa. 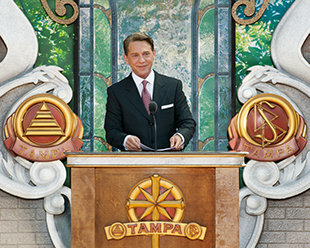 Mr. David Miscavige, Chairman of the Board of Religious Technology Center and ecclesiastical leader of the Scientology religion dedicated the new Church of Scientology of Tampa in honor of Founder L. Ron Hubbard’s Centennial year. More than 2,000 Scientologists were on hand when the new Church of Scientology of Tampa opened its doors in the historic Ybor Square. The new facilities represent a major stride toward the fulfillment of the Church’s mission to serve the greater Tampa Bay community. The Church of Scientology Tampa opened on March 13, 2011, the 100th anniversary of the birth of Scientology Founder L. Ron Hubbard. The new home for the Church of Scientology occupies the historic Ybor Square in the heart of old Tampa. Tampa’s original cigar factory now serves as an ideal home for the Church of Scientology. The new facilities enable the Church to better provide its social and humanitarian programs to the benefit of Tampa Bay. Careful detail was paid to the preservation of the historical black iron steps that lead to the entrance of the Church of Scientology Tampa. These steps were once the site of the famous gathering and speech by Cuban national hero, José Martí, in 1893. The new home for the Church of Scientology Tampa has a history dating to 1886, when Vicente Martinez Ybor, a pioneer in the tobacco industry, made Tampa his home. It was here he established what is now Ybor Square as his manufacturing center. The Church meticulously restored this landmark, which is open to the public. The Church of Scientology of Tampa extends a welcome to all visitors to tour the Public Information Center. Its displays feature films on Scientology beliefs and practices. This original tobacco presssits in the foyer of the new Church of Scientology Tampa. It is one of the many artifacts preserved in the new Church. Ybor Square’s historical embossed tin panel ceilings were carefully preserved and restored by the Church of Scientology. The Church of Scientology of Tampa Public Information Center presents hundreds of films, providing an introduction to Dianetics and Scientology, as well as the many Church-sponsored social betterment and humanitarian programs. The Church of Scientology Tampa presents an exhibition dedicated to the life and legacy of Founder L. Ron Hubbard. The Church’s grand opening commemorated Mr. Hubbard’s Centennial birthday celebration. Just off the Public Information Center stands the Factory Building’s historical staircase. At the turn of the last century, every morning hundreds of tabaqueros (cigar makers) and other cigar factory workers climbed these stairs to reach the “galley”, as the factory floor was called. All congregational gatherings are convened in the Church of Scientology of Tampa Chapel—Weddings, Naming Ceremonies (christenings) and Sunday Services. The Chapel provides for its thriving congregation and serves as a venue for community events and functions. The Scientology Chapel is the site of all Church religious services. It also hosts public gatherings and community banquets. A full wing of the Tampa Church is devoted to the delivery of Scientology Introductory services. These include seminars such as the Personal Efficiency Course, an evening seminar providing fundamental Scientology principles applicable to every aspect of life and work. The L. Ron Hubbard legacy comprises tens of millions of published words, recorded lectures and films on the mind, life and spirit. These materials are available to parishioners and newcomers alike. The bookstore offers materials in English and Spanish, while Mr. Hubbard’s beginning library is available in 50 languages. In the Hubbard Guidance Center Scientologists receive spiritual counseling known as auditing. Auditing provides a precise route by which individuals may travel to higher states of spiritual awareness. On the second floor of the Stemmery Building sits the historical Reader’s Stand, circa 1886. The Reader (El Lector) read for the cigar makers as they worked. Reading material included Spanish language newspapers, as well as translated English newspaper and popular novels. The new Church of Scientology Tampa is equipped to deliver auditing (spiritual counseling) to Scientologists from all over Tampa Bay. The Church stands ready with dozens of auditing rooms, each ideally appointed to provide a calm, distraction-free setting for spiritual enlightenment. The Church of Scientology of Tampa includes dozens of auditing rooms, each ideally appointed to provide the calm, distraction-free setting necessary to achieve spiritual enlightenment. L. Ron Hubbard developed the Purification Program to free individuals from the mental and spiritual damage caused by drugs. The Tampa Church of Scientology’s Purification Center pays homage to the history of Ybor city. Scientologists study an array of courses to train as auditors (spiritual counselors), capable of applying Dianetics and Scientology technology to help others attain spiritual freedom. As is traditional in all Churches of Scientology, an office of L. Ron Hubbard stands in honor of the Founder and symbolizes that this Church is true to his writings and ideals. The Church of Scientology of Tampa is open seven days a week and welcomes anyone interested in learning about Dianetics and Scientology or the Church’s many social betterment and humanitarian programs. The new home for the Church of Scientology Tampa stands in the heart of Ybor City. Registered as a historical landmark, the Church meticulously restored the 88,000-square-foot facility. The celebration marking Scientology Founder L. Ron Hubbard’s hundredth birthday (March 13, 1911) began Saturday evening, March 12, with a momentous Centennial Event including a two-hour biographical presentation of the Founder’s life. It was attended by more than 6,000 in Clearwater, Florida. The following day, Sunday, March 13, thousands of Scientologists next gathered for a Grand Opening ceremony to dedicate the Church of Scientology of Tampa in its new home, the landmark Ybor Square. The new Tampa Church was made necessary by a fourfold growth in Tampa’s Scientology congregation over the past decade. The 88,000-square-foot Church houses a Public Information Center presenting the beliefs and practices of Scientology, including the life of its Founder. The Information Center further presents an overview of all Church-sponsored humanitarian programs, including its initiatives for Human Rights, drug education and prevention, literacy and learning centers, as well as its world-famed Volunteer Minister program providing disaster relief and indiscriminate help.The Public Information Center also includes multimedia displays with nearly 500 documentary films. Ybor Square is a designated National Historic Landmark. Originally built in the late 1880s by city father Vincente Ybor, the complex of three buildings served as the “cigar capital of the world” at the turn of the 19th century. In making Ybor Square its home, the Church has meticulously restored the historic site. It features period artifacts, including an original tobacco press, original embossed tin panel ceilings and original wrought iron steps at the entrance. Also preserved is the building’s “lectern,” the wooden platform from which “readers” read to workers to both entertain and educate. 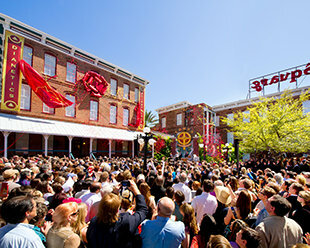 Mr. Miscavige concluded his address by officially dedicating the building to the Church’s Founder, L. Ron Hubbard.